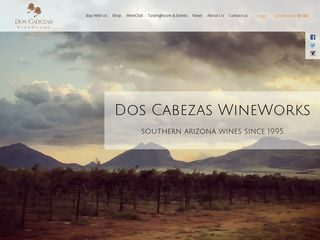 Short Business Description: Dos Cabezas WineWorks is a family-owned and operated winery that challenges the perception that Arizona does not produce exceptional wines. Dos Cabezas WineWorks has been producing wines in Arizona since 1995. The winery was originally located on the 80 acre Dos Cabezas Vineyard near Willcox, AZ. Just after the harvest of 2006, winemaker Todd Bostock purchased the winery with the help of his wife Kelly and his parents Frank and Paula. The winery was moved to Sonoita, Arizona, close to the vineyard the family planted in Elgin in 2003. Dos Cabezas WineWorks is a family-owned and operated winery that challenges the perception that Arizona does not produce exceptional wines. Dos Cabezas WineWorks has been producing wines in Arizona since 1995. The winery was originally located on the 80 acre Dos Cabezas Vineyard near Willcox, AZ. Just after the harvest of 2006, winemaker Todd Bostock purchased the winery with the help of his wife Kelly and his parents Frank and Paula. The winery was moved to Sonoita, Arizona, close to the vineyard the family planted in Elgin in 2003.